Do you know how social media impacts SEO? Are your own search and social efforts aligned? For many marketers, it’s not always clear how social media impacts search engine optimization. In this article you’ll find numerous resources to help you understand how social media SEO works. It’s not enough to have a popular website with good content anymore. If you want better search engine results for your business, it’s time to look at how social media influences those results. Search engines have begun to incorporate social signals (Facebook likes, retweets, +1s and so on) to inform their search results. The following articles dig a little deeper and explain what you need to do to make sure you succeed at social media and SEO. 6 Reasons Social Media Is Critical to Your SEO: If you need more clarity on how SEO and social work together, Stephanie Frasco explains on Social Media Today that the old days of website marketing are over and Google has found a newer, smarter way to measure the popularity of your website—social media. How to Succeed at SEO With Social Media Marketing: On ExactTarget Amanda Nelson likens SEO and social media to peanut butter and jelly, the idea being that the two need each other to succeed. Dig in and enjoy the nuggets of wisdom and some best practices shared in a conversation between Amanda and her guest, Ray Grieselhuber. 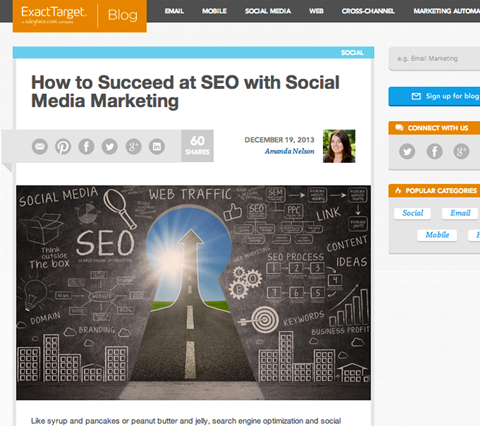 SEO and social media go together. You’ll hear it over and over because it’s true: “Content is king, and everything else is gravy!” If you can get your content right, you’ll have set a strong foundation for SEO success. Here are some posts to get you thinking in the right direction. Why Content Is Part of a Smart SEO Strategy: Google continues to push a quality-over-quantity approach to drive search traffic to a website. In this post on Search Engine Journal, Sujan Patel explains why quality content is important to SEO and how your strategy must go beyond keyword optimization and link-building. 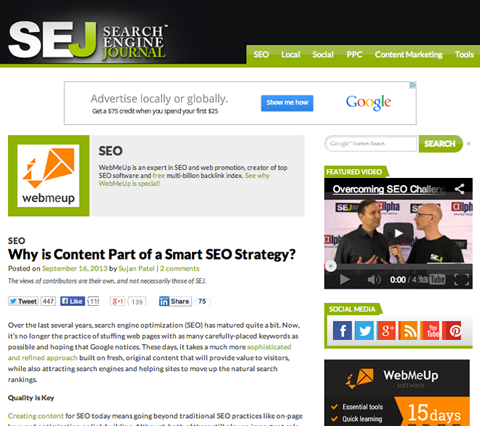 Quality content is important to your SEO. How to Write So Google Loves You (Easier Than You Think! ): Do you often wonder whether you should be writing for people or for search engines? Well, this excellent post from Nicholas Whitmore instructs you to just “write how you speak“—and with good reason. Check it out! Getting people to share your content on Facebook, Twitter, Pinterest, Google+ and other networks connects your brand to the wider social web, which allows your message to potentially reach thousands of prospects. 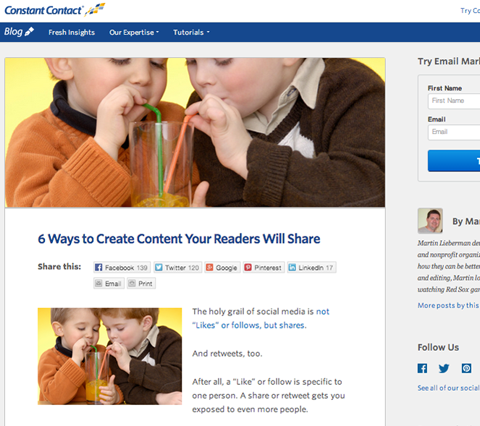 The following posts explain how to get your content shared easily and quickly. How to Customize Your Social Share Buttons for Increased Traffic: In this helpful how-to Social Media Examiner post, Angie Pascale walks you through the process of pre-populating social media share buttons for Twitter, Google+, LinkedIn, Pinterest and Facebook with links to your own website. 6 Ways to Create Content Your Readers Will Share: This short and sweet post by Martin Lieberman of Constant Contact reminds us that the holy grail of social media is not likes, but shares and retweets. Social sharing is the tech version of word-of-mouth marketing that drives new business for a brand. Social sharing affects your SEO. Social Sharing: How to Inspire Fans to Share Your Stories: In this Social Media Examiner podcast, Simon Mainwaring explains how to tap into the power of your fans to spread your stories. One important lesson he shares is that brands have to stop talking about themselves and start talking about their customers. 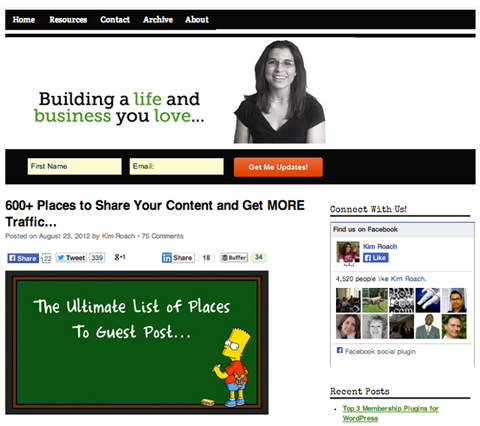 600+ Places to Share Your Content and GET MORE Traffic: This is priceless! After you’ve hit the Publish button on your blog, you’re not done. This ultimate “power list” compiled by Kim Roach shows you 600 different places where you can distribute your posts to reach an even wider audience. Distribute your posts to drive more traffic. The Essential Guide to Content Sharing: Asking people to share your content is a simple way to boost your page traffic. Ian Cleary of RazorSocial shares a collection of social media “super tools” that make it incredibly easy to promote your content and reach new audiences. If you’ve been blogging for a while, you know that images can be a powerful SEO magnet. The problem is, they’re often overlooked in favor of written content. This is a big mistake. These articles explain how images impact SEO and the different areas of image optimization that you need to focus on. 3 Ways to Optimize Images for Search, Social Media & User Experience: Ashley Zeckman of TopRank Blog explains how images can have a big impact on visibility in search engines. Her actionable tips on how to make your images important searchable assets are a must-read! 5 Must-Have WordPress Plugins for Perfectly Optimized Images: Ann Smarty provides an impressive list of absolutely must-have WordPress plugins to optimize blog images and see your traffic spike. It’s got a lot of important details, but thankfully the screenshots make it easy to follow along. 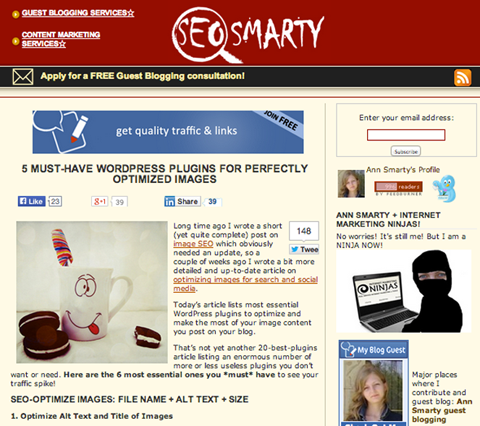 WordPress has plugins that help you optimize your images. SEO Boost Your Social Media Profiles: Alex Chris shares how to optimize social media profiles on Facebook, Google+, Twitter and Pinterest for more brand exposure. The benefit of doing this is that more people will be able to find your profile, connect with you and ultimately visit your website. Sweet! One of the most important features of Google+ is authorship. Simply put, this feature allows the author’s picture to appear next to search results of content they have created. The following posts explain how Google authorship impacts content creators and SEO. 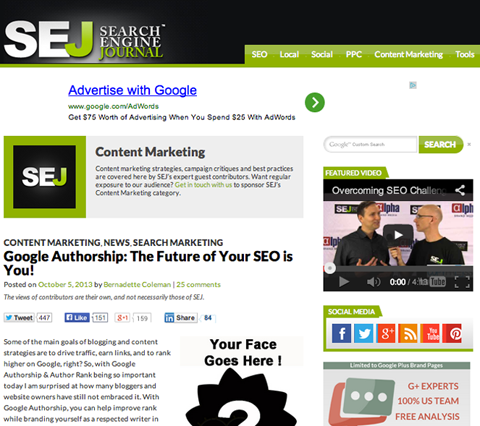 Google Authorship: The Future of Your SEO Is You! : Over at Search Engine Journal, Bernadette Coleman reminds us how important it is to embrace author rank. With Google authorship, you can improve your search ranking and brand yourself as a thought leader in your field. And all you have to do is add a face to your work! Google Authorship will improve your search ranking. How to Add Google Author Tags to Your Blog for Improved Search Results: In this Social Media Examiner article, Don Power asks, “Does Google know you’re the author of the content you publish?” A lot of bloggers don’t know how to answer that question, so if you’re one of them, you need to read all about it here! 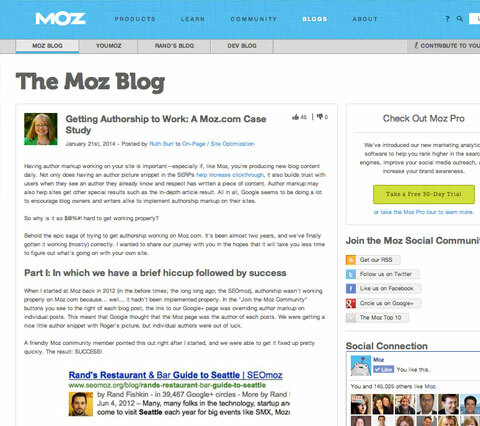 Getting Authorship to Work: A Moz.com Case Study: What can you do if you have trouble getting Authorship to work smoothly on your blog? Ruth Burr from MOZ, shares how her company navigated several hiccups to successfully integrate Authorship into Moz.com, so you can troubleshoot your own installation. Troubleshoot any problems you have with Google Authorship. Whatever your goal, measure! Measuring and analyzing your efforts are key to having effective SEO tactics. When you track and analyze what’s working, you can focus on the things that matter. These very instructive posts will start you off on the right foot! Measuring What Matters in Social Media: There are many reasons your brand uses social media in the first place—increasing brand awareness, generating leads, driving sales and many more. The only way to know whether you’re achieving those goals is to measure them. 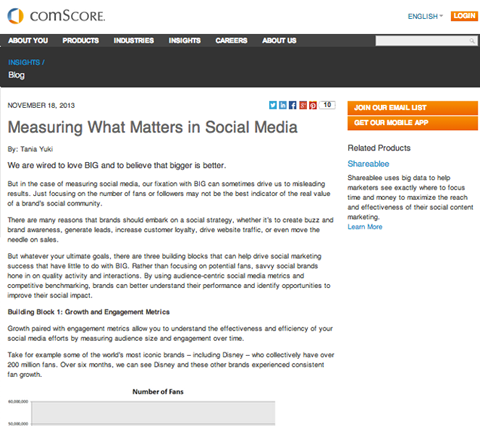 Unfortunately, as Tania Yuki of ComScore observes, many brands get fixated on measuring the wrong things. Measure the metrics that relate to your goals. How to Measure Your Social Media Traffic Using Google Analytics: Liz Lockard is spot-on with her comprehensive instructions for using Google analytics to track the impact of your social media traffic. Having this information helps you know where to focus your efforts in social media! What do you think? Do you have other tips and tactics to add to this list? Please share and link up additional resources in the comment box below.